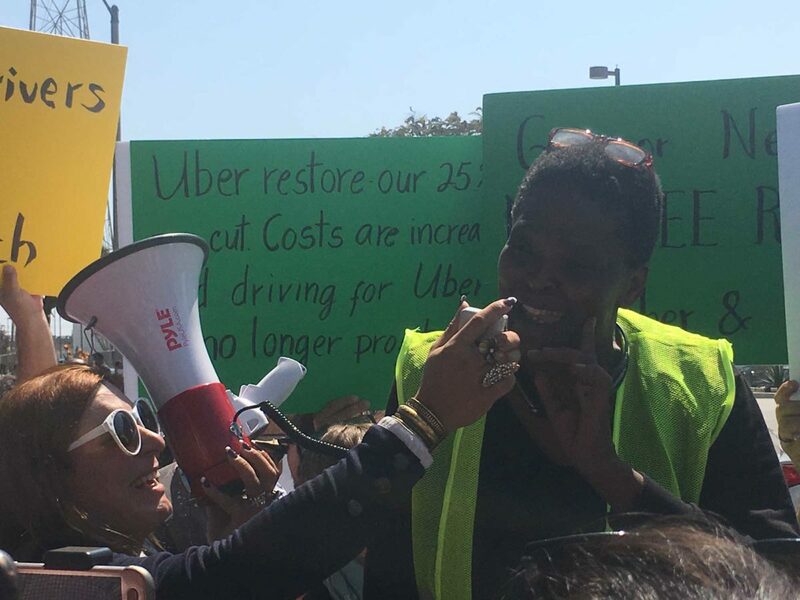 More than 150 rideshare drivers rallied to protest pay cuts and practices of tech companies Uber and Lyft on Monday at Uber’s Redondo Beach Greenlight Hub, the largest center for in-person communications between the company and its drivers in the Los Angeles area. The strike urged drivers to turn off their apps and refuse to take rides for 24 hours. At the crux of the protest was the push for driver’s rights, including the right to organize and minimum hourly pay. The driver action took place owing to a pay rate change imposed by Uber on March 11. Los Angeles-area pay rates for per-mile distance were cut by as much as 25 percent, while rates for time driven were increased by 16 percent. That equals out to pay of about 60 cents per mile driven, according to drivers at the event. Minimum fare payments were also decreased by 30 percent for UberX and UberPool rides. Drivers making a minimum of $3.70 per ride have been cut to $2.60 per ride. “Drivers told us that they value promotion opportunities, so we’re introducing a new Quest promotion feature, while also changing the per minute, per mile and minimum fare rates. These changes will make rates comparable to where they were in September, while giving drivers more control over how they earn by allowing them to build a model that fits their schedule best,” an Uber spokesperson said. Today on its website, Uber entices drivers by saying they may earn at least $2,200 for their first 300 trips in Los Angeles. New drivers are also promised guaranteed minimums for their work, should they meet Uber benchmarks. “The pay was good. I was getting about 80 cents per mile,” said driver Mario Rodriguez, of Koreatown. Rodriguez has been driving rideshare vehicles for three years, initially to supplement his income. The extra incentives posed by Uber were good too — meeting goals for customer trips completed would earn drivers bonus pay, and drivers were offered pay incentives to buy new vehicles. Rodriguez said that he was getting nearly $300 a week for buying a new vehicle. “I drive about 100 to 200 miles a day, full-time. That’s a beating on my car…now it’s worth half what it should be worth,” Rodriguez said. Now his car, purchased in 2016, has more than 60,000 miles on it, roughly 4.6 times more than the average U.S. driver’s annual mileage of 13,476, according to U.S. Department of Transportation estimates. And as Uber has cut its rates, his monthly costs are piling up: A $450 car payment, $320 for rideshare insurance, at least $30 daily for gas. Rideshare driver Nicole Moore began driving to help ends meet when her family had to refinance the mortgage on her house. Moore was among the organizers of the Monday afternoon rally, citing the organization’s proposed Driver’s Bill of Rights. Rideshare drivers classified as independent contractors are not covered by state labor laws. That may change should State Assembly Bill 5 pass. AB 5 is based on a 2018 Los Angeles Superior Court ruling agreeing that a delivery company misclassified drivers as contractors, rather than as employees. The bill does not include rideshare drivers among its short list of jobs exempted from the language.